In The Sketchnote Handbook, Mike Rohde breaks down the process for sketchnotes. He found that writing his notes in pen in a small sketchbook and giving himself permission to doodle made taking notes so much more fun and less frustrating. If you’ve been having problems paying attention in class or in meetings, or you’ve been frustrated by your inability to remember key points from conferences and presentations, this is for you. No art degree required. Here’s my one-page summary. Click on the image for a larger version, and feel free to share it! If you’ve always been curious about how to start sketchnoting, this is the best book I’ve come across so far. Read this, then read Dan Roam’s Back of the Napkin for more business-oriented visual tools. 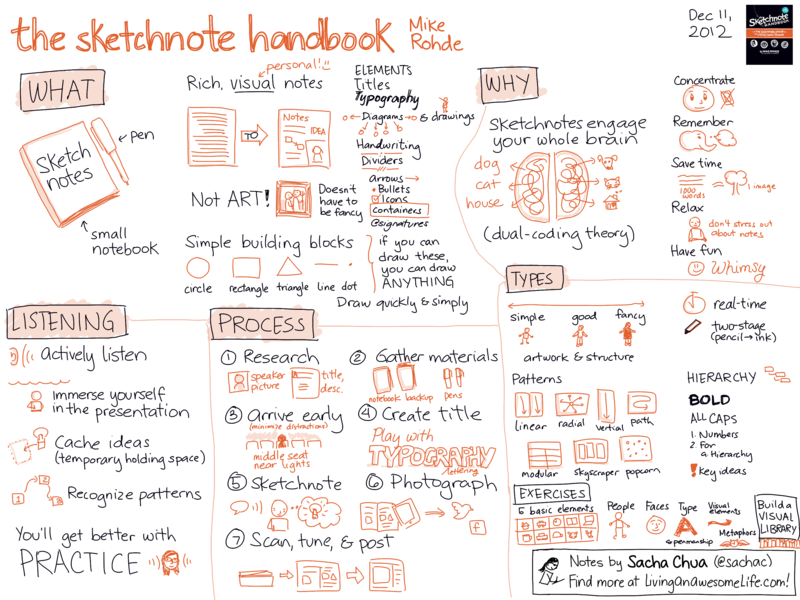 If you’re ordering through Peachpit, use the coupon code SKETCHNOTE to get 35% until Dec 31, 2012. It’s roughly the same price on Amazon (affiliate link). Note that there’s a video edition that includes 70 minutes of video tutorials, which is great for bringing these ideas to life. Check out my other sketchnotes and visual book notes for more business- and technology-related visual summaries!